Bruce McBay. Illustrated by Kim LaFave. Vancouver, BC: Tradewind Books, 2008. Wendy and Zach worked most of the morning, shaking and mixing, bending and stretching, reaching and leaning, brushing and rolling. They painted squares and triangles and circles, each a different colour. Variety is the spice of life, said Zach. 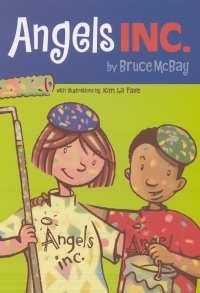 Angels Inc. is author Bruce McBay's beginner level novel which tells the story of Wendy and Zach, two characters who seem to be 12-years-old and who decide to spend their Saturdays helping people in their neighbourhood. Their efforts, such as helping an old lady across a street she does not wish to cross and painting a neighbour's old garage multiple colours when he did not want it painted at all, are initially unsuccessful. Eventually, the two become heroes when they stop two thieves who have been scouring the neighbourhood offering to help clean out seniors' garages for charity but who are, in fact, looking to steal antiques. McBay's setting of this story in Vancouver is the most interesting part of the book. Local children will recognize references to Granville Island Market and to the restaurants in Point Grey. But this is a very small audience. They story of Angels Inc. is simplistic and mildly interesting. The vocabulary makes this material appropriate for eight and nine year-olds, but the story's climax, about thieves masquerading as charity workers, seems out of the knowledge base of this age group. 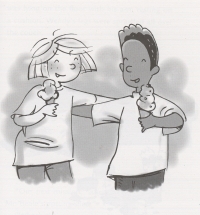 Kim LaFave's illustrations, included with text they illustrate and offered every three or four pages, are detailed and add to the reader's comprehension of the text. His early two-page dedication page illustration which depicts Granville Island and its surrounding area is excellent. Robert Groberman is a grade three teacher at Kirkbride Elementary School in Surrey, BC.